General Plastics offers large-scale capacity for converting polyurethane foam, high density foam materials and other nonmetallic substrates into production parts for OEMs and Tier 1 / Tier 2 manufacturers. Our production facilities include multiple sizes of CNC machines to provide you with maximum cost efficiency: We can accommodate small- to large-dimension projects, and scale from prototypes to a high-volume run. Knowledgeable customer service and CNC teams are committed to ensuring your success from concept to product delivery. Our CNC programming supports nearly any data file format. No data file? We can work from an adequately dimensioned part drawing. General Plastics has extra-large routers for large projects and CNC vertical milling machines for intricate details and production work. We’re also equipped with a variety of non-CNC cutting equipment that can accommodate entire foam buns, so we can manufacture large volumes of foam shapes at minimal cost. Your parts program requires accuracy, prompt service, consistent quality and cost-efficiency. Our CNC-machining services deliver on all that – and more. Why waste money and time shipping foam sheet stock or buns – at full rate – to a third party to machine and re-ship them as parts to you? Let General Plastics produce, bond-to-size, and machine our foam to your exact specifications. 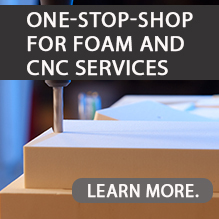 We’ll ship your CNC-machined parts ready-to-use in far less time – and at a fraction of the shipping costs.